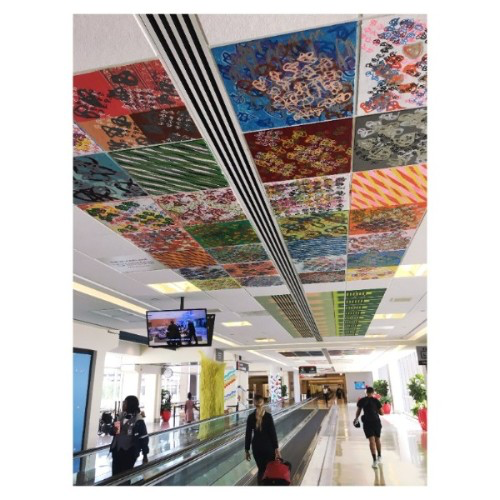 In August, my ceiling piece for Philadelphia International Airport's "It's A Wrap: 20 For 20", curated by Leah Douglas, was installed and will be on view until Summer 2019. Twenty Philadelphia-based artists were chosen to create site-specific installations around the airport. My project consists of layers of symbols made with acrylic paint on drop ceiling tiles meant to evoke language, but one that is indecipherable and one where the viewer can ascribe their own meaning to. The installation is in Terminal A-East and is accessible by ticketed passengers. If you're traveling through PHL in the coming months, look up!